Fridays usual afford the archaeologists an opportunity to finish the tasks at hand and review the progress made so far. Today was no exception, and I’m happy to have some great views of the redan to share. The work of removing the remnants of the 1786 floor of the Lower Market the top of the redan was completed today, allowing us to get a good look at the scars left by the demolition of the upper parts of the wall ca. 1784–1785 (see below left). 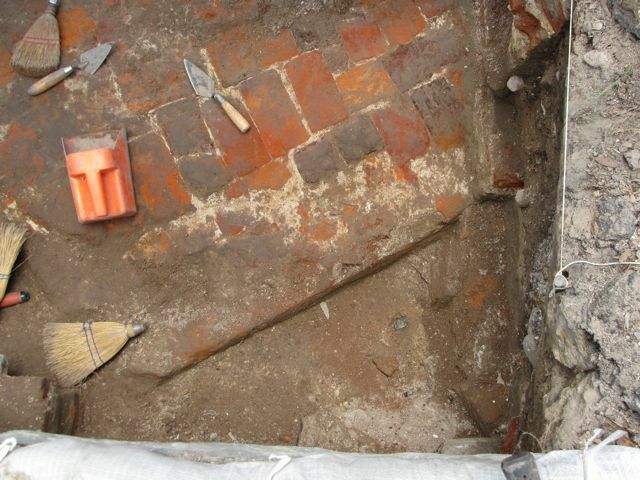 This work also revealed the inside edge of the redan’s south wall (see below center), which unfortunately abuts the extreme northern limit of our dig site. 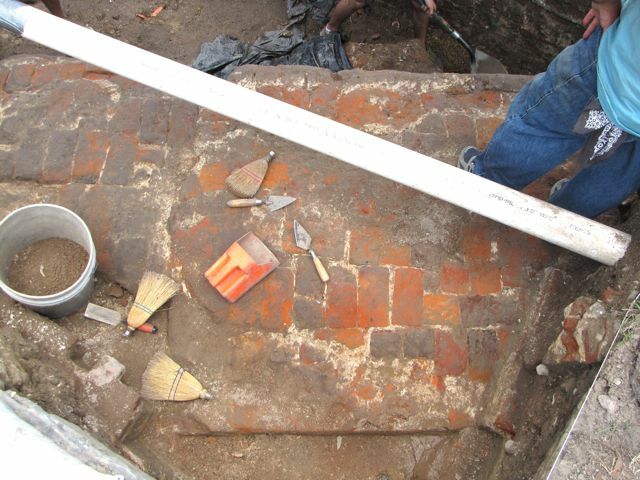 Just as we found in 2008 while excavating the north wall of this redan, the breadth of the wall at this point is five feet at the top. 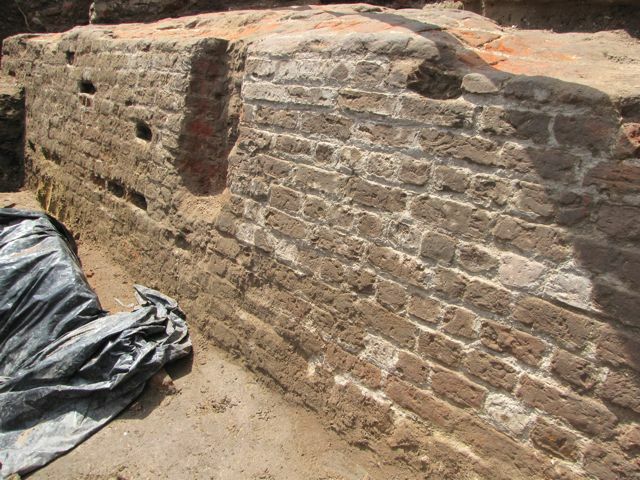 The original breadth of the upper parts of the wall, which were demolished after the American Revolution, is still somewhat of a mystery, but we have definitely located a large fragment of that upper wall. 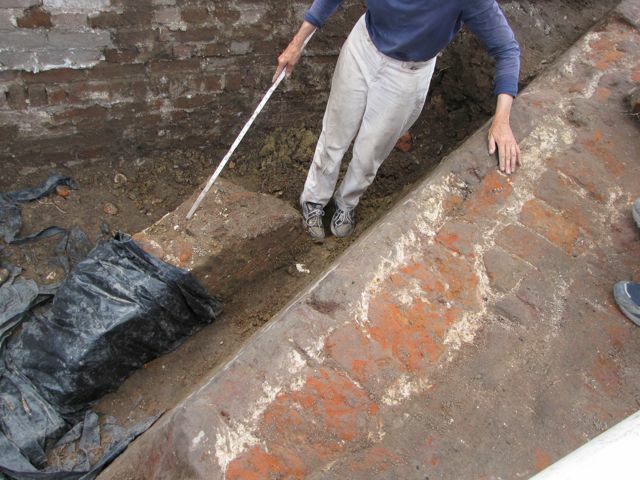 The photo below right shows Martha Zierden pointing to a large chunk of brickwork that tumbled down from the upper part of the redan when it was demolished. We’ll definitely learn more about this large fragment next week. As a result of the students’ hard work, our view of the redan in general is much improved. For those of you not able to visit the site in person, I offer you the following images. The first, below left, is a shot looking down the south flank of the redan from very near the point. The second, below right, is a flawed panoramic view (imperfectly stitching three photos together) showing the top of the exposed redan wall, from the apex at the left toward East Bay Street to the right. Another day, another round of new artifacts. 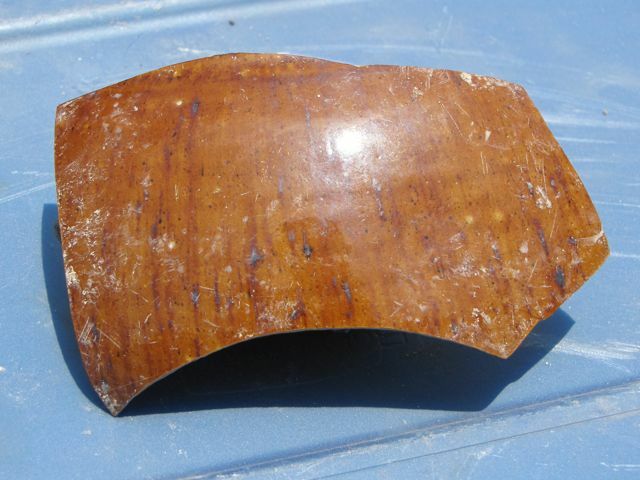 The earth is yielding some late-seventeenth- and early-eighteenth-century objects this week, such as this fragment of bowl-form mottled manganese ware (below left). 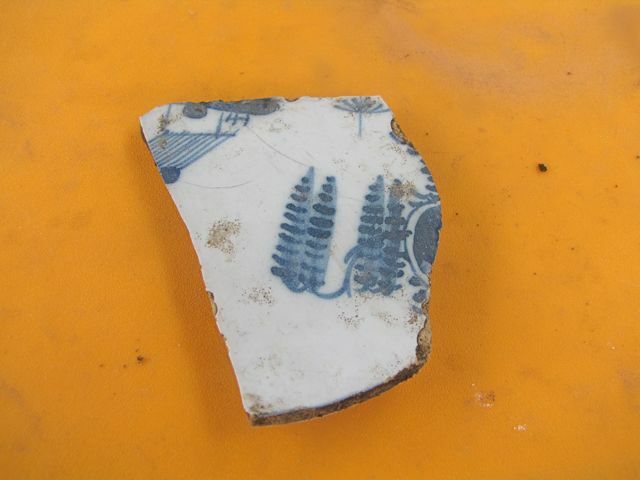 Many pieces of early Delft ware have been found, such as this fragment of a flat, footed plate (below center). 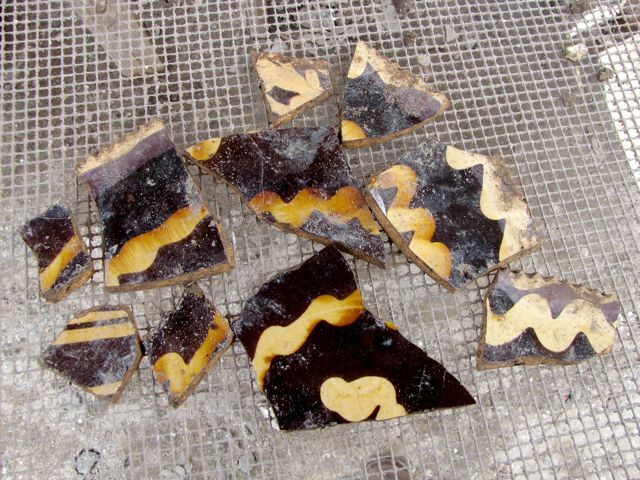 The final photo (below right), taken on one of the sifting screens, shows a cache of the sort of early combed and trailed slipware that has been very plentiful at this site. Fabulous stuff!